Welcome to the Taillights superstore at TunersDepot.com. We have huge selection of replacement taillights with all the options you want. Our store is fully loaded with altezza taillights, euro taillights, LED taillights. If you are looking for altezza tail light, L.E.D. tail lamps or other euro taillights, you have come to the right place! At TunersDepot.com, we offer the most and the newest replacement taillights for a wide range of car models. TunersDepot is the ultimate shopping destination for your replacement tail lights needs! We carry different brands of our altezza taillight, red/clear taillights and LED taillamps line, such as KS altezza lights, KS LED taillights, KS Euro taillamps, Sonar altezza lights, Sonar red/clear tail lamps, Sonar L.E.D. tail lights, TM (aka JY) altezza tail light, TM (aka JY) LED taillamp, TM (aka JY) euro taillights, TD halo taillights, TD L.E.D. taillamps, TD euro altezza lights. At TunersDepot.com, you can also find many replacement taillights with different color options to choose, there is black housing altezza taillight, somke tail lamps, halo altezza lamps, LED taillamps and red/clear euro tail lights. Black housing and LED replacement taillights have became more popular in the market because the factory taillights are usually made in chrome housing and you can see immediately with the different in the appearance after the installation. How do I install a set of tail lights? Unlike installing headlights, most tail lights are usually pretty easy to replace. Most trucks are especially easy. With a few tips though, you can make an easy installation even faster and more painless. 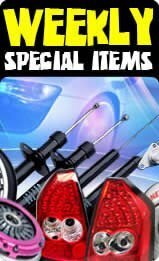 Is it hard to install tail lights onto my vehicle? A good way to tell is to check your stock tail lights to see if you can get to all the screws from the front. If not, check to see if you can access the area to the rear of the taillights without undoing too many clips. In the unusual case where you don't even see any clips to undo the carpet or the panel behind the tail lamp, then the installation will probably be difficult. Inspect the new set of tail lights to make sure you can complete the installation with the tools you have available. Disconnect your car battery's negative battery terminal. If your stereo requires a key in order to reboot, please be sure you have it before disconnecting the battery. Also, be aware that you will probably have to reset your clocks, etc. after reconnecting the battery later. Please note that some vehicles (such as newer GMs) have extremely sensitive electrical systems. In these cases failure to disconnect the battery before attempting installation may lead to blown taillamp fuses or other damage. Apply painters tape on the vehicle around the edges of your taillights to prevent any scratches that might occur while removing and installing taillamps. If uninstalling your rear bumper is required, make sure you have a safe surface to place the bumper on and that the working surface below the vehicle is also safe in the event the bumper falls down. This step is particularly important because tail lens, unlike headlights, often require a little force to come loose, leaving many people to inadvertently scratch their vehicles in the process. 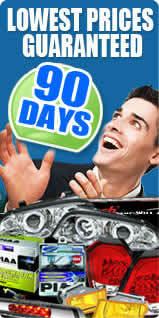 Without touching the glass, uninstall the stock brake, signal and reverse bulbs (as applicable). For bulbs with flat rectangle harnesses, you just pull the bulb firmly outward. For bulbs with round bases, you usually just push them in a bit, and then turn a quarter turn to release them. Once the bulb is removed, place them in their original container (if available). If they are cold, you could also store them in a ziplock type of bag. Please note that if your tail lamps have a harness that can be separated via a main harness that leaves part of the harness with the bulbs inside the tail lights, you will still need both parts of the harness since the aftermarket tail lights are designed to either re-use the stock bulbs (altezzas) or to connect directly into the bulb harnesses (LED taillights). Unscrew the taillamps from the front or use a socket wrench to undo the tail lamps from the back. Be aware that the tail lights might fall immediately once the tension of the bolts is removed. For this reason, it is best to lightly hold the lights in place with your free hand as you unbolt or unscrew them. Remove the old taillens and store in a way that the lens will not be scratched. Install the new tail lens and bolt / screw in place. Altezza Tail Lights: Reinstall the old bulbs into the new taillights. Be aware some taillights might make use of a conversion harness that connects into one of your stock harnesses and splits the function into two separate bulbs. In these cases, the new bulbs should be included. LED Tail Lights: Some of your stock bulbs, such as the reverse lights, might be re-used in your new LED lights. For the rest, the LED lights will come with male plugs that should be identical to the ends of your stock bulbs. Connect these into your stock harnesses. For plug in type harnesses, please try to install the plugs in the opposite orientation if they do not work. LED Tail Lights: Since LED taillights operate at a lower wattage than your stock bulbs, they include a resistor in order to regulate the current being passed to them. While sometimes this box is internal, more often it is external and connected via a plastic plug. In the case of an external resistor box, it needs to be mounted somewhere (they usually have double sided tape on the backs) where it will be away from heat and moisture. Reconnect your battery and turn on your taillamps and check for proper operation and blinking speed. If any functions are not operational, try flipping the plugs the reverse orientation and double checking that the resistor boxes are fully connected. Are these tail lights sold by piece or as a pair? All our taillights are sold in the full pair. When you pay the listed price, you receive the complete set including both the right and the left sides. Are these tail lights street legal? As far as we know the Sonar and KS brand taillights on our website are all street legal as mandated by federal law in the United States. This basically means that they are designed to the specifications set forth by the DOT (United States Department of Transportation). Occasionally, DOT might test models for compliance. If any taillights fail (rare) DOT will have the companies issue a recall. For those tail lens, you can return them to us for a refund. For any other brands besides Sonar and KS, we can not guarantee DOT compliance. Also, please be advised that your local laws that may disallow these sorts of taillights to be used. After I installed LED tail lights my front signals are blinking fast. What do I do? Your front and rear signals are connected, so when you have a problem with one you will have a problem with the other. A fast blinking signal usually points to too much wattage going through the system. This can be caused by three different situations: 1) a dead bulb in the front or the rear, 2) the appropriate plug on the LED taillight being plugged in upside down, or 3) the resistor box not being connected or malfunctioning. How can I prevent my tail lights from fogging up? During the first few days of operation, it is normal to see some moisture appear in your taillights. This is due to the small amounts of moisture in the plastic and coating that are evaporated when the taillights are first warmed up during use. This sort of moisture is normal and should disappear within a few days. To be sure that no external moisture gets into the tail light though, it is a prudent idea to silicone seal the edges. Clear silicone sealant can be found in any hardware store (and some auto part stores), and can be applied to the seam along the taillights where the clear lens meets the rear housing. Also, even if a bulb has died, make sure to keep it installed in the tail light until you replace it to prevent moisture from entering through the bulb hole. Can I smoke my tail lights? While smoking your taillights (tinting them) is certainly possible through the use of carefully applied spray tint (use light even coats), doing so may make them too dark to be legal. Please check your local laws as well as smoked taillights of any darkness might be illegal in your area. Our 355 Tail Lights (Altezza Style),Tail Lights (LED Style),Tail Lights (Red|Clear Style) Reviews have an average rating of 4.9 out of 5 stars. Every customer can leave a review about our service and the product that was purchased. In order to leave your review for the purchased product, please log into MY ACCOUNT after you receive your order. We encourage all of our customers to take the time to share their experiences with our website with everyone. Taillights were just as shown and service and shipping were very speedy.